WinnerIsTheJudge (Week 2) "choose one that hasn't been chosen"
1) This contest will last exactly one week. 2) Each person may enter only one card for this challenge. The card can be swapped out any time before the contest ends. 5) After the contest is judged, the first place winner gets to decide what the next weekly challenge is and become the new judge. So only enter if you are willing to host the next challenge. 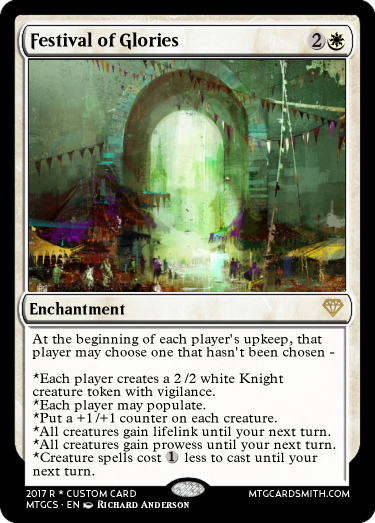 This week's contest is to make a card with this text in it: "choose one that hasn't been chosen"
Presentation, art selection, templating, spelling, balance, creativity and flavor. Top 3 winners will get a super amazing -TROPHY-! A) The first place winner will win a month of premium subscription. B) Top three entries get a favorite. We changed the name of the challenge. Old name was "Make Me A...."
Better yet, we added some bonus prizes. Courtesy of the group hug initiative! B) We'll favorite the top three entries as well. I thank you for your support. Another example made by me. ^I'm not sure about the wording though. Should this say "that player's next turn." instead of "your next turn."? Yes, it should say the "that player". Will be posting our first entry momentarily! Thanks! I'll fix my example card. Did you submit a card? I can't see the image and I can't click it neither. I'll fix it shortly then. Yes, it works now. Thanks! 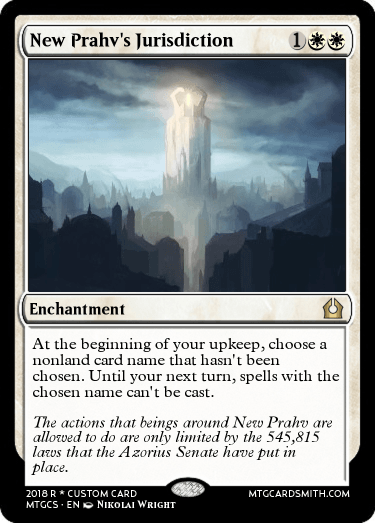 Are you going to make another card named "In the Valley of the Damned", or is that a mistake? Edit: Fixed, I'm not used to MSE. I also created this for an example card in my contest Out Of This World in case you would like to swing by there, @Tomigon! Thanks for the bump and entries! 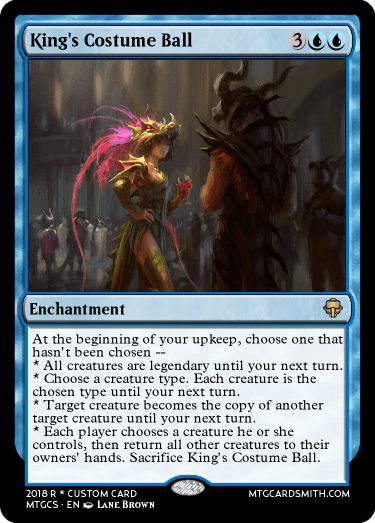 "Choose one that hasn't been chosen at random-"
"Choose a card type that hasn't been chosen." "Choose a color that hasn't been chosen." You can change the text as long as it says you choose something that hasn't been chosen. 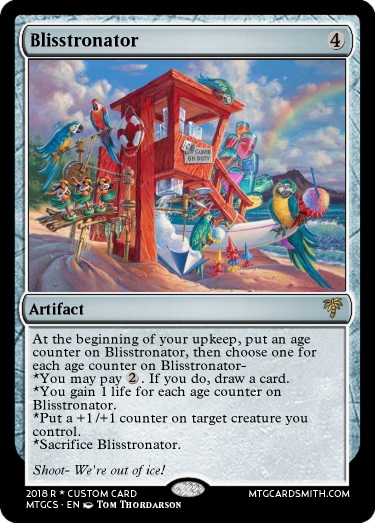 I would have had the wording be "At the beginning of your upkeep, put an age counter on Blisstronator, then choose one that hasn't been chosen this turn for each age counter on Blisstronator," but that was unnecessarily wordy and the card already works with this wording. Does this work for you @Tomigon? Also, Tom Thordarson is a great artist. Woohoooo!!! Thanks for your entries everyone! That's an interesting card. but sorry,,it doesn't fit the criteria. 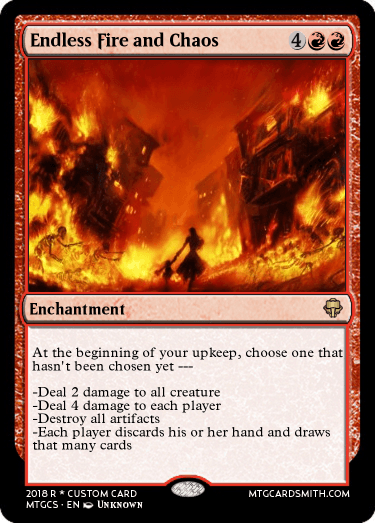 You mentioned "'that hasn't been chosen this turn' is unnecessarily wordy and the card already works with this wording. " "this turn" is unnecessarily. 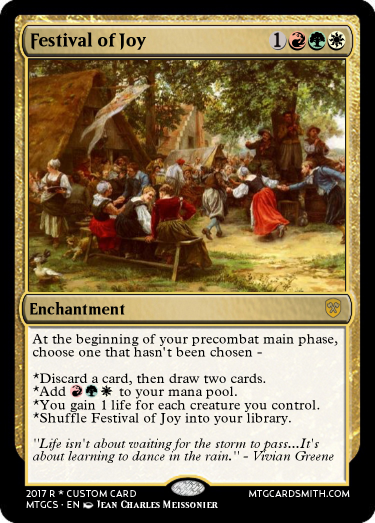 If you see cards like Cryptic Command, Mystic Confluence, we can know that we can't choose the same mode more than once unless it says "You may choose the same mode more than once." But you need to add "that hasn't been chosen" to that card if you want to make it valid for this contest. The card is not the same with that text. If you put one age counter on it and choose the 1st mode, in the next turn, you can't choose the 1st mode. I like the card, but sorry, it doesn't count in this contest! I spotted another mistake too! Let this be a lesson kids... don't leave the house mid-card and then come home and press Publish!